XMP metadata includes an optional field named label. A label is a text or tag you can assign to an image. 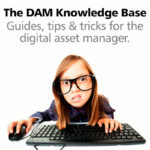 Digital asset management systems with XMP support like IMatch use this label for various purposes. Common examples are labels like ‘Red’, ‘For Review’, ‘Für den Druck’ or similar. Most XMP-aware applications also associate colors with a specific label texts, e.g. 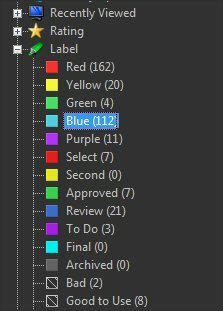 using a red color indicator for files with the label text ‘Red’ or blue for ‘For Review’. There is no standard for label texts or if and how label names are associated with colors. Or how an application displays labels and colors in the user interface. IMatch displays XMP color labels in the File Window. The fact that labels are ‘hard-coded’ text stored inside XMP metadata often leads to problems when you work with multiple XMP-aware applications, you switch RAW processors or you work in teams with a mix of tools and user interface languages. A German RAW processor might write the label ‘Rot’ when you assign a red label to a file, while the English version of the same software writes ‘Red’ instead. Sometimes application vendors also change the label names between different versions of their products. This may create a challenge for long-term archival, consistency and interoperability. Thankfully, IMatch has the features to handle this. IMatch supports XMP labels in a variety of features, e.g. in the File Window, the Metadata Panel or the Viewer. In order to be compatible with all label-generating applications out there, it handles any number of labels and allows you to add your own labels and associate colors with each label individually. To configure XMP labels, open Edit > Preferences > Metadata. IMatch by default ships with a mix of labels which cover the most frequently used applications. You can add, rename and remove the pre-configured labels to your liking. 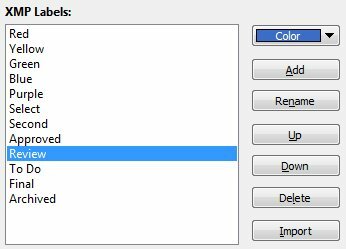 Add all label names used in your other applications and configure IMatch to use the same color to ensure inter-application consistency. Note that changing a label here has no effect on the labels already stored in your files! To change a label globally, follow the instructions below. When you click the Import button, IMatch scans the database and adds all unique label names used in your files to this list. This makes it very easy to pick up the various labels used in your files, to assign colors or to re-arrange their order to make them directly accessible via the keyboard shortcuts <Shift>+<1> to <Shift>+<5>. Sometimes you need to replace labels in entire sets of files, e.g. in order to consolidate labels between applications or to change the language used for a label. IMatch automatically maintains collections for each label used in your database. To see all files with a specific label, just click on it. 2. Select all files in the File Window and assign the new label – that’s all. After a write-back, all files have the new label stored in their XMP data.